Gosh, my Very Distant Cousin Fräulein Schmidt hit it out of the ballpark last night when taking the following records to consider "How old WAS she?" high school graduation. Original in possession of the author. The author's mother, Barbara Jeane (Froman) Player Tatham, daughter of Frances, was the informant for the funeral card info. Barbara confides to author circa 1974 that Frances never told her second husband Mike A. McDonnell her true age because he was younger than Frances. 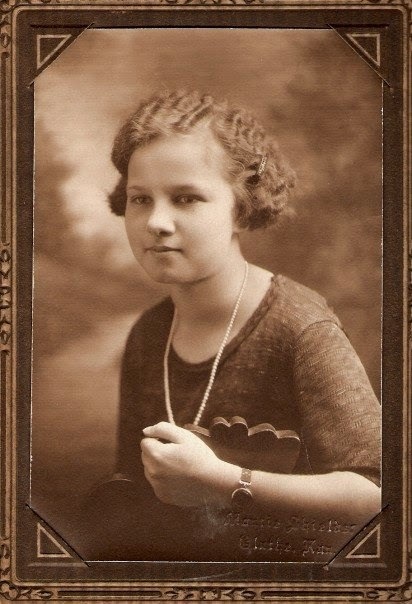 The author's grandmother Frances made Barbara promise to always list Frances' birth date as 22 August 1908, so she would appear three years younger. Goering Family Bible states Frances Irene Goering was born 22 August 1905. 1910 US Federal Census where Frances, age 4, is in the household of her known father Charles Henry Goering and his wife Stella Mae, her known mother, implies birth year is 1905/06. 1920 US Federal Census where Frances, age 14, is in the household of her known father Charles Henry Goering and his wife Estella, her known mother, implies birth year of 1905/06. 1925 Iowa Marriage License Application where Frances Goering states she is 19 years of age, implies birth year of 1906. 1930 US Federal Census where Frances, age 24, is in the household of her known husband Lowell Froman, implies birth year of 1905/06. Social Security Death Index entry for Frances McDonnell 531-03-4240, states date of birth is 22 August 1905. Fräulein Schmid views each item LIVE, and adds to her research outline LIVE, demonstrating how she lists all info items without prejudice, and with all documents in hand, she THEN works through analysis. +Susan Howard comments during the live broadcast "It appears that the month and day of her birth was 22 Aug so I would take into account the actual date each of the censuses took place and the date of the marriage license to figure the year of birth.﻿"
+Betty-Lu .Burton comments "Many people went back and got a delayed birth certificate for the SS [Social Security card] application﻿."